Tip 8: Get Enough Protein (Out of Spite) | Weird! Why Aren't You Vegan? In developing this website, I’ve found that there are actually quite a few people who aren’t vegan. Weird, I know! Most of these folks are thoughtful, compassionate and great critical thinkers, so the only reason for them not to be vegan must be a lack of information. For these people, I decided to include some tips on how to be vegan, so they can get started right away. As a new vegan or someone transitioning to veganism, you have probably already discovered that Americans are obsessed with protein. It’s the first question most people get when they tell someone they’re vegan. We’ve been fed (ha!) a line of bull from the agribusiness companies about how animal products are the only foods that contain protein, and that we have to eat them to be healthy. But, as my best friend Colleen Patrick Goudreau says (don’t ask her about that, just trust me: we’re best friends), we all know people with heart disease, Type 2 diabetes and high cholesterol, but none of us knows anyone with kwashiorkor. Most of us have never even heard that word before. That’s because the first three ailments are diseases of excess, meaning we get them because we eat too much (which we do in the U.S.), while kwashiorkor – or protein deficiency – is caused by not getting enough food (which is, generally speaking, not a problem here). As you can read about in this article, nobody needs to worry about getting enough protein as long as he or she (or “they,” which is a thing now) is getting enough calories. Once you learn this information that nobody else around you seems to know (especially your “hilarious” Uncle Mike, who jabs you about being a vegan any chance he gets but is suffering from all the diseases of excess mentioned above – who’s laughing now, Mike? 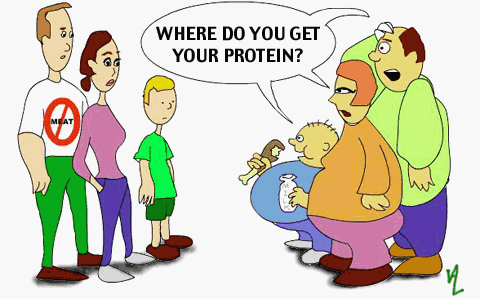 ), it becomes really frustrating to hear over and over that “vegans don’t get enough protein.” So, what can you do? Get enough! And then rub it in! To everyone! As vegans, we are right. We have to be. Non-vegans’ eating habits are based on what society tells them to eat; our food decisions are based on compassion and logic (gluten free vegans not included). We must not only get enough protein, we must get a tonnnn of it. Get enough for you and five of your vegan friends – and your vegan dog (that’s right, vegan dog). Pack on the protein and show the world that vegans get plenty, pal! You can single-handedly crush one of the worst misconceptions of veganism! Proteins are the building blocks of life, and everyone loves life! 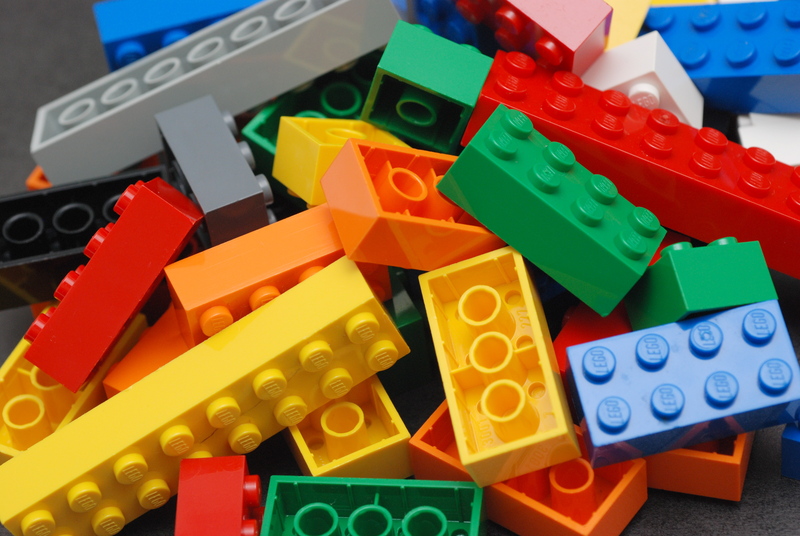 And building blocks! You can use this as a stepping stone toward making up your own stupid marketing slogans, like “Beets: It’s What’s for Dinner” and “Salad Fork: the Other White Meat” (they don’t have to make sense). Even if we all do this and debunk once and for all the myth that vegans don’t get enough protein, there will always be another false assumption to combat. There’s evidence that too much protein isn’t helpful and can even be really harmful to your body. So, there’s that… You know what? Please ignore this entire post. But do read the resources I linked to, because they’re legit. Sanjay Gupta just did a thing on protein this past week, saying adult men, on average, only need about 50g per day (that’s 2 burgers) and women need about 40g. Wow. Considering most non-vegans are getting 150g per day, we’ve got a lot of ground to cover! !